The global inflatable packaging market is gaining from the exponential growth of global protective packaging market. Inflatable packaging is a type of flexible packaging that offers high protection to fragile goods against shocks during transit. This makes inflatable packaging preferred among product manufacturers, retailers, and logistics service providers. Inflatable packaging is also environment friendly over its bulkier counterparts such as paper cushioning and loose-fill peanuts. A report by Transparency Market Research (TMR) estimates the global inflatable packaging market to expand at a CAGR of 6.0% for the forecast period of 2017 to 2025. Progressing at this rate the market will be worth US$3.1 bn by the end of 2025 from a valuation of of US$1.95 bn in 2016. The report segments the global inflatable packaging market on the basis of material type, packaging type, end-use, and geography. Depending on material type, PE, PA, and PET are the segments into which the global inflatable packaging market is divided in this report. The PE segment is further sub-segmented into LDPE and HDPE. Of them, PE segment leads the market accounting for a little over than 50% share vis-à-vis value. The LDPE sub-segment is anticipated to display an impressive over 6.8% CAGR over the forecast period. In terms of packaging type, the global inflatable packaging market has been bifurcated into bubble wraps, inflated packaging bags, and air pillows. The bubble wrap segment, amongst all, accounts for more than two-third market share in terms of value. Inflated packaging bags are predominantly used for packaging of wines, champagne, spirits, etc. On the basis of end-use, the inflatable packaging market has been segmented into personal care and cosmetics, homecare, healthcare, automotive and allied industries, electrical & electronics, e-commerce, shipping & logistics, and food & beverages. Among these, e-commerce is expected to lead the market holding one-third of market share in terms of value over the forecast period. Shipping and logistics is the second-leading end-use segment contributing substantial revenue to the overall market. Shipping and logistics end-use segment is gaining from the double-digit growth of e-commerce industry. The global inflatable packaging market has been segmented into five regions, namely North America, Asia Pacific, Europe, Latin America, and the Middle East and Africa. North America is anticipated to lead in terms of both value and volume over the forecast period. The region is estimated at 714.4’000 tons of consumption of inflatable packaging in 2017, and the consumption is expected to further reach 1,067.6’000 tons by the end of 2025. Europe is another key region for inflatable packaging. Expanding at a CAGR of 4.0% over the forecast period, the demand will translate into a revenue of US$615.9 mn in 2017, and further to US$818.2 by the end of the forecast period. However, Asia Pacific is projected to display the leading 8.6% CAGR over the forecast period. The region is expected to emerge as a lucrative market for inflatable packaging over the forecast period. Key players operating in the global inflatable packaging market include Smurfit Kappa Group, Sealed Air Corporation, Pregis Corporation Storopack Hans Reichenecker GmbH, FROMM Packaging Systems Inc., Automated Packaging Systems Inc., Macfarlane Group plc, Polyair Inter Pack Inc., Inflatable Packaging Inc., Omniverse Foster Packaging Group Advanced Protective Packaging Ltd., Aeris Protective Packaging Inc., Free-Flow Packaging International Inc., A E Sutton Limited, Easypack Limited, Uniqbag Lp, Green Light Packaging Ltd., and Airpack. This report provides forecast and analysis of the inflatable packaging market on global level. It provides actual data of 2016 along with estimated data of 2017, and forecast data up to 2025 in terms of revenue (US$ Mn) and volume (thousand tons). The report also includes macroeconomic indicators along with an outlook on global Inflatable packaging consumption pattern across the globe. It includes drivers and restraints of the global Inflatable packaging market and their impact on each region during the forecast period. The report also comprises the study of current issues with end users and opportunities for Inflatable packaging market manufacturers. It also includes value chain analysis. In order to provide users of this report with comprehensive view of the market, we have included detailed competitiveness analysis and company players with their SWOT analysis and strategy overview. The dashboard provides detailed comparison of global Inflatable packaging manufacturers on parameters such as operating margin, total revenue, product portfolio, and what we call ‘innovation scale’. The study encompasses market attractiveness analysis by material type, packaging type, end use type, and region. 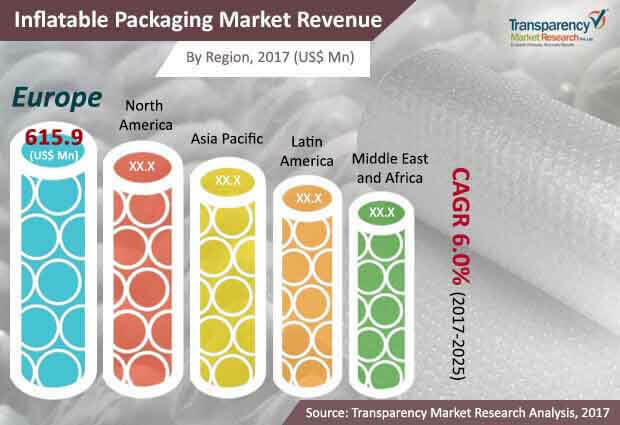 Market numbers have been estimated based on extensive secondary and primary research, average pricing of Inflatable packaging by material type and the revenue is derived through regional pricing trends. Market size and forecast for each segment have been provided in the context of global and regional markets. The Inflatable packaging market has been analyzed based on expected demand. Prices considered for the calculation of revenue are average regional prices obtained through primary quotes from numerous regional Inflatable packaging manufacturers, suppliers, and distributors. All key end users have been considered and potential applications have been estimated on the basis of secondary sources and feedback from primary respondents. Country demand patterns have been considered while estimating the market for various end users of Inflatable packaging in the different regions. Bottom-up approach has been used to estimate the Inflatable packaging market by regions. Global market numbers by material type, by packaging type and by end use industry have been derived using the bottom-up approach, which is cumulative of each country’s demand. The same has also been validated from top-down approach. Company-level market share has been derived on the basis of revenues reported by key manufacturers. The market has been forecast based on constant currency rates. The report includes consumption of Inflatable packaging market and the revenue generated from sales of Inflatable packaging across the globe and key countries. By material type, Inflatable packaging market is segmented into polyethylene (PE), polyamide (PA), PET, and others. PE segment is further segmented into LDPE and HDPE. By packaging type, inflatable packaging market is segmented into bubble wraps, inflated packaging bags, and air pillows. Air pillows segment is further segment into high grade, general bubble wraps, low or limited grade, and temperature controlled and others. By end use industry Inflatable packaging market is segmented into personal care and cosmetics, healthcare, homecare, automotive and allied industries, electrical & electronics, e-commerce, shipping & logistics, and food & beverages. The report provides detailed competitive and company profiles of key participants operating in the Global market. Key Players of the global Inflatable packaging market are Smurfit Kappa Group, Sealed Air Corporation, Pregis Corporation Storopack Hans Reichenecker GmbH, FROMM Packaging Systems Inc., Automated Packaging Systems, Inc., Macfarlane Group PLC, Polyair Inter Pack Inc., Inflatable Packaging, Inc., Omniverse Foster Packaging Group Advanced Protective Packaging Ltd Aeris Protective Packaging Inc., Free-Flow Packaging International, Inc., A E Sutton Limited, Easypack Limited, Uniqbag Lp, Green Light Packaging Ltd., Airpack (India).